Eddie Ramirez, 15, outside his mobile home in Snow Hill, N.C. He's been working in tobacco fields during the summer for several years. A new report from Human Rights Watch says the practice of children farming tobacco is hazardous and should be stopped. The group interviewed more than 140 kids in 2012 and 2013, including Eddie, who work on tobacco farms in the South. From the sparse mobile home he shares with his mother in Snow Hill, N.C., Eddie describes feeling lightheaded and queasy after a 12-hour day in the tobacco fields. "In the mornings, tobacco is wet because of the dew and, like, the rows are narrow and the tobacco is really big. You just feel like you're suffocating or can't breathe really well," he says. "You just want to stop and not do it no more." 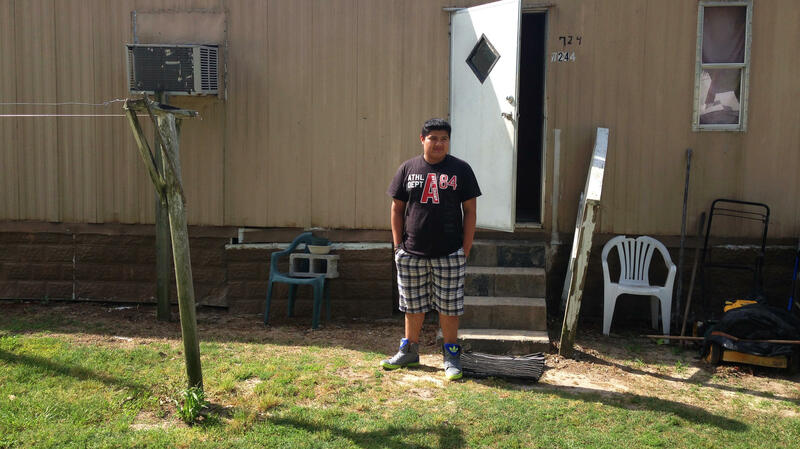 Eddie, who's in the eighth grade, is hired by contractors who provide labor to growers in the area. His family came here from Honduras when he was 7. By the time he was 12, Eddie says, he had started working in the fields alongside his mother to help make ends meet. "We found that the overwhelming majority of kids we interviewed got sick while they were working in tobacco fields with nausea, headaches, dizziness, lightheadedness," says Human Rights Watch researcher Margaret Wurth. "And many of the symptoms they reported are consistent with acute nicotine poisoning, which happens when workers absorb nicotine through their skin." No one tracks how many kids work on tobacco farms, so there's no way to know how common or widespread the practice is. But Human Rights Watch argues that it's too hazardous and should be illegal. Matt Myers, president of the Campaign for Tobacco-Free Kids, says the report points out a gaping hole in U.S. labor law. "It's outrageous that in 2014, children are still working in tobacco farms. It is well-known how dangerous exposure both to nicotine and to the many pesticides used on tobacco is to kids," Myers says. Congress has resisted changing farm labor laws, and the Labor Department withdrew proposed stricter standards for kids in 2012 under political pressure. Human Rights Watch is now calling on major tobacco companies to get kids out of the fields. The report notes that tobacco giant Philip Morris International has the most comprehensive child labor policy — but that it doesn't go far enough. Miguel Coleta, director of external labor policies at PMI, says the child labor abuses outlined by Human Rights Watch violate company guidelines. "If children are doing hazardous work, that has to stop," Coleta says. But Coleta says there are roles for kids younger than 18 on farms, under the right conditions. For example, he says, "ensuring that whatever children are doing on the farm is appropriate to their age and is not something that is undermining their health or their future." Top U.S. cigarette makers, including Altria and R.J. Reynolds, say they require growers to protect young workers. Altria spokesman Jeff Caldwell says there are some jobs kids can perform safely. "The Human Rights Watch recommendations to prohibit youth of any age from handling or coming into contact with tobacco is counter to a lot of farming practices that currently take place in the U.S.," Caldwell says. In North Carolina, 15-year-old Eddie Ramirez is hopeful the newfound attention to his summer job will bring changes like safety gear and places to use the restroom. In the United States, it's against the law for anyone under the age of 18 to buy tobacco products. But it's legal for a person that young to work in tobacco fields. A new report by Human Rights Watch, which investigated the practice in the south of the U.S., says the work is hazardous, and it should be stopped. DEBBIE ELLIOTT, BYLINE: U.S. labor laws allowed kids as young as 12 to work in agriculture. Fifteen-year-old Eddie Ramirez is one of them. EDDIE RAMIREZ: I've done blueberries, sweet potatoes, cutting like, herbs and everything. RAMIREZ: It just sticks to my hand. It's like really sticky, you know, and like, really yellow. ELLIOTT: And nearly impossible to wash off, he says. From the sparse mobile home he shares with his mother in Snow Hill, N.C., Eddie Ramirez describes feeling light-headed and queasy after a 12-hour day in the tobacco fields. RAMIREZ: In the mornings, like, tobacco is wet because of the dew. And like, the rows are like, narrow sometimes and like, the tobacco is like, really big. You just like, feel like you're suffocating, or you can't breathe really well. Like, you just want to stop and not do it no more. ELLIOTT: Eddie Ramirez, an eighth-grader, works in the fields in the summer, hired by contractors who provide labor to growers in the area. His family came to the U.S. from Honduras when he was 7. By the time he was 12, Eddie says, he started working in the fields alongside his mother to help make ends meet. Eddie is among the 141 youth interviewed by Human Rights Watch in four Southern states during 2012 and 2013. Researcher Margaret Wurth. MARGARET WURTH: We found that the overwhelming majority of kids we interviewed got sick while they were working in tobacco fields; with nausea, headaches, dizziness, lightheadedness. And many of the symptoms they reported are consistent with acute nicotine poisoning, which happens when workers absorb nicotine through their skin. ELLIOTT: No one tracks how many kids work on tobacco farms, so there's no way to know how common or widespread the practice is. But Human Rights Watch argues it's too hazardous and should be illegal. Matt Myers, president of the Campaign for Tobacco Free Kids, says the report points out a gaping hole in U.S. labor law. MATT MYERS: It's outrageous that in 2014, children are still working in tobacco farms. It is well-known how dangerous exposure both to nicotine and to the many pesticides used on tobacco, is for kids. ELLIOTT: Congress has resisted changing farm labor laws; and the Labor Department withdrew stricter standards for kids a few years ago, under political pressure. Human Rights Watch is now calling on major tobacco companies to get kids out of the fields. The report notes that tobacco giant Philip Morris International has the most comprehensive child labor policy, but that it doesn't go far enough. Miguel Coleta, director of external labor policies at PMI, says child labor abuses outlined by Human Rights Watch violate company guidelines. MIGUEL COLETA: If children are doing hazardous work, that has to stop. ELLIOTT: But Coleta says there are farm roles for kids under 18, under the right conditions. COLETA: Ensuring that whatever children are doing on the farm is appropriate to their age, and is not something that is undermining their health or their future. JEFF CALDWELL: The Human Rights Watch recommendations to prohibit youth of any age from handling, or coming into contact with, tobacco is counter to a lot of the farming practices that currently take place in the U.S.
ELLIOTT: In North Carolina, 15-year-old Eddie Ramirez is hopeful the newfound attention on his summer job will bring changes, like safety gear and places to use the restroom. Debbie Elliott, NPR News. Transcript provided by NPR, Copyright NPR.